When you�re looking to reduce nasal congestion, allergy symptoms, and generally Breathe Easier, NOTHING is better than Aquegel Breathe Easy Moisturizer with Eucalyptus! 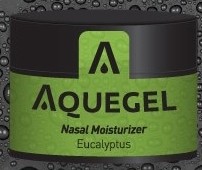 Aquegel�s specially formulated gel restores moisture levels to dryness in nasal passages caused by congestion and allergies so you can BREATHE EASY! Aquegel is the product you have been waiting for � a drug free, long lasting sinus relief product that moisturizes dry and congested nasal passages. Aquegel�s specially formulated gel is safe for all ages and provides 8-12 hours of ACTUAL moisture relief. Unlike most OTC Sinus Sprays and Products Aquegel does NOT contain OXYMETAZOLINE HCI and PHENYLEPHRINE HCI which are known to cause rebound �effect, side-effects, and dependency! Without these harmful chemicals, Aquegel has NO USE RESTRICTIONS and no risk of dependency!!! Aquegel is the ONLY moisturizer that contains 50% Moisture � Weight by Volume. This means Aquegel is the ONLY moisturizer that slowly dissolves into tiny microscopic moisture encapsulations, working like an aqueduct to deliver a steady stream of moisture to the areas being treated over a period of 12 hours! This revolutionary homeopathic moisturizer contains an aqueous solution encapsulated in a gelatinized base which closely resembles the moisture produced naturally by the human body. Since it is so similar to the bodies naturally produced moisture�it is more readily absorbed when applied topically. Aquegel is the only TRUE nasal moisturizer because when applied topically, the human body�s natural temperature begins to melt Aquegel�s gelatinized (hydo-carbon) base, a layer at a time, into microscopic moisture bubbles called micro-encapsulations!!!! The micro-encapsulations contain water and salt in the same concentration as your body. Aquegel Breathe Easy is commonly used to moisturize dryness due to: Congestion, Allergies, Sinusitis, Continuous CPAP(Supplemental Oxygen) Therapy. Ingredients: Light hydrocarbon oil, Distilled Water, Methylcellulose, PEG, Zinc Gluconate, Sodium Chloride, Benzyl Alcohol and Eucalyptus Oil.